Forty-odd years ago, Shep Gordon was an aimless youth, dealing drugs to support himself, when a chance meeting with Jimi Hendrix at the Hollywood Landmark Hotel changed his life. Sizing he new acquaintance up, the guitarist suggested that Gordon try his hand at talent management. Not long after, Gordon signed Alice Cooper as his first client. They’ve been together ever since and that was just the first step in a life that has included, in addition to representing musicians, making movies, befriending the Dalai Lama, and turning chefs into superstars. Actor and comedian Mike Myers and Gordon met when the former was making Wayne’s World. A fast friendship formed and when Myers was going through a rough patch in his life, it was to Gordon whom he turned. What started as a short stay at Gordon’s Maui home stretched into months and seeing him daily and listening to his stories convinced Myers that Gordon was the perfect documentary subject. 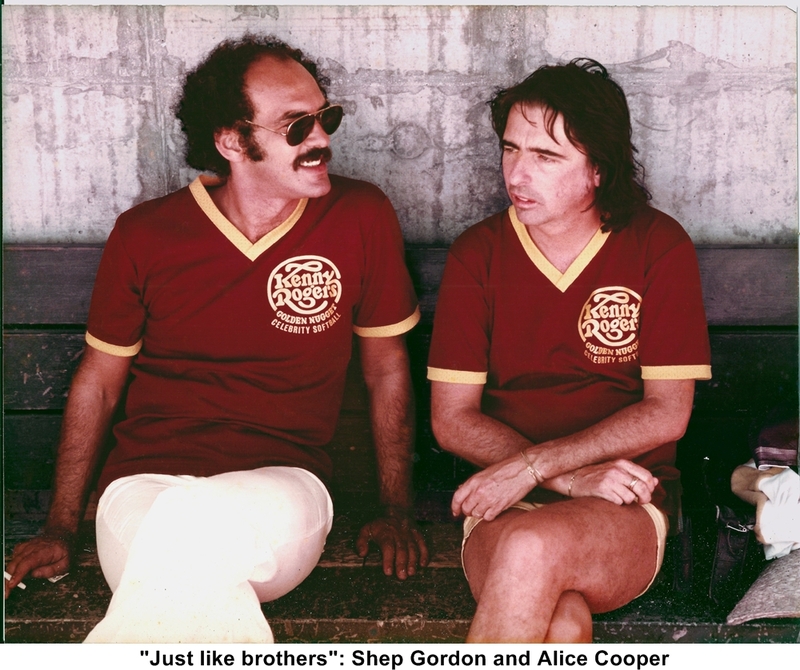 Thus, Supermensch: The Legend of Shep Gordon was born, an affectionate and lively film that includes not just Gordon’s tales of his adventurous existence, but also testimonials from famous friends, including Cooper, Myers, Michael Douglas, Sylvester Stallone, and Emeril Legasse. Supermensch: The Legend of Shep Gordon recently screened at the San Francisco International Film Festival where Gordon himself sat down to talk about his storied life and how he feels to find himself in an unaccustomed spotlight. Q: One of the things that stands out in this movie is your sense of ethics, which is not that common in the world of talent management. Where does your sense of ethics come from? A: My dad was a really wonderful man, really wonderful. I have no idea, really. I was just talking to a Jewish journalist for a Jewish publication, and we were talking about the social liberal aspect, which I think probably comes from DNA – it’s a Jewish trait. I have no idea where the ethical – it just always felt right. I never really had a set of principles. I just did what I thought was right. And I got very lucky with Alice as my first client, because he had a very strong religious upbringing. So his sense of right and wrong, is disciplined, learned, and he believes it 100 percent. It was really easy for me to be ethical, because I had an ethical artist. Sammy Hagar lives here and I’m going to see him tonight. The first time I met Sammy he was in a group called Montrose. We had hired them to open for Alice in Tampa, Florida in ’72. They were getting like $500 or $300, it was nothing. A hurricane came and blew the stadium apart. We couldn’t do the show. We had no obligation to pay them; we weren’t getting paid. I went into Alice’s dressing room and I said, ‘Listen, we can afford to not get paid, but if they’re only getting $300, that’s gas money, that means they won’t sleep in a hotel tonight. Let’s just pay them.’ He said, ‘Oh, great, we should.’ Sammy couldn’t believe that someone actually paid them when they didn’t have to. That was an ethical decision, that just was the right thing to do. I never thought of it as ethics, just as the right thing to do. Q: How did Mike Myers approach you about making the film and what your feelings were about it when he first talked to you about it? Q: One of the most moving things about the movie is people talking about you. Listening to someone like former Golden State Warriors coach Don Nelson say he’d like to kiss you on the mouth says so much about you and what you mean to people. When you watched the film for the first time, what was your reaction to that? A: I was really humbled. I was amazed how many people gave up stuff that most public figures would never give up. Alice saying, ‘I would have been two years and gone.’ That’s from an artist, who’s an icon in the Rock ‘n Roll Hall of Fame. That’s pretty humble. Sylvester Stallone, who has this image of this tough, macho guy, talking about anybody being better than him at anything or wanting to emulate anyone. Just everybody. Mike, his words. It was very humbling. Now, I can watch it and accept it, but it was weird. I went to Mike and asked him, ‘Did you write these things for them?’ He said, ‘No.’ That was my first thought, that maybe they were scripted, but they weren’t. I had a really warm feeling, that I have friends [like that]. Q: Where do you you might be right now if you hadn’t stopped off at the Hollywood Landmark? A: You know, I have no idea. It’s really funny. I have no idea. I was with my partner, Joe Greenberg, we probably just would have kept dealing or tried to or something. I don’t know. My whole life has sort of been like that. If I hadn’t been at the restaurant that night when Mr. [Roger] Vergé came in, would there be celebrity chefs today? I don’t know. I’m just happy to have taken the journey. It’s an interesting question that I’ll never know the answer to. Q: When you look back over your career, and you’ve had so many facets of it, is there one thing that stands out more than anything else? A: I think the thing I’m proudest of is the celebrity chefs, really creating a new category. Also, Alice and I are just like brothers, I almost take that too for granted, ’cause I know how much that changed the world and how important we were to it. It’s so part of me. I think probably those two. The celebrity chefs is very rewarding to me, because they were really underserved. I’m really proud that I had a part in that. Q: The film does its best to try to encapsulate a very varied life with the different industries you’ve been involved with and different adventures. Was there something that maybe got left out, some big part of your journey, some aspect there wasn’t time to go into?